Have you ever been at an event or trade show where someone wanted to pay for your services by credit card, but had to decline because you had no way to accept payments? This problem may soon be a thing of the past. There are now credit-card reading devices that physically plug into your smartphone, allowing you to swipe cards and accept payments on location. Best of all, because the technology is still so new, most companies offer the devices and services at little to no cost to the business. It’s a win-win situation. Here’s a rundown of a few of the companies offering card-readers for smartphones. Like its name, the card-reader offered by Square is a small, white, square device that plugs into the headphone jack of your smartphone. The device itself is free. Additionally, there are no monthly fees or merchant accounts required to use the service. The Square service has slightly higher service fees than other companies, but because it’s essentially free otherwise, it’s great for businesses who accept payments sporadically. PayPal also offers a free thumb-sized card reader and free app that connects with your smartphone. Their fees are also similar to Square’s and they have no monthly commitment. However, the service is on “exclusive release” now, meaning they won’t send the device to just anyone who asks. Instead, if you are interested in using PayPal’s Here service, you will need to sign up for their wait list, and they will contact you upon availability. Intuit also offers a free mobile payment service, called GoPayment. Their free transaction rates are on par with the other two services. However, GoPayment also has a monthly plan option, where you can reduce your transaction fees by 1%, if you pay a monthly service fee of $12.95. The monthly plan could be a great option for businesses processing a large volume of on-demand credit card payments. As long as you have a smart phone, you have the ability to accept payments on demand, wherever you are in the world. Order one of these devices and you will never have to turn away a paying customer again. 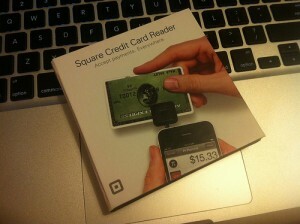 Do you use a card-reader to accept credit cards on demand? How does it work for you? Leave us a comment telling us about it. Julie Strier is a freelance writer who enjoys helping you do business anywhere. Email: julie@mybusinesswriter.com. Website:www.mybusinesswriter.com.